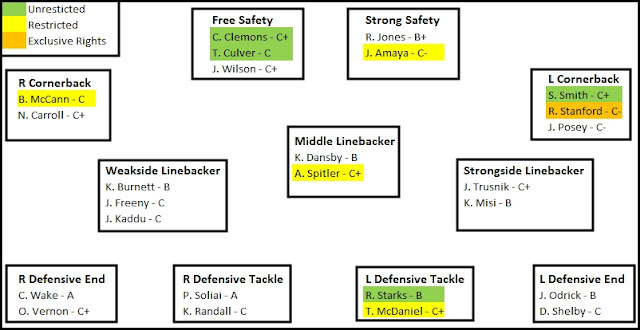 In the previous post the Miami Dolphins offensive free agents were analyzed in an attempt to identify which should be re-signed and which should be left to test the free agent market. In this post, Dolphinshout will analyze Miami's defensive free agents to see which should be pursued before the official start of free agent bidding begins on March 12th. The previous post began with a brief explanation of the three types of free agents. These are listed below with a color code associated with each type. A more complete definition of the three types can be found HERE. Unrestricted Free Agent: A player with four or more years experience is eligible for unrestricted free agency. Restricted Free Agent: A player with 3 years of experience is eligible for restricted free agency. Exclusive Rights Free Agent: A player with 2 years experience is eligible for exclusive rights free agency. The Miami Dolphins have a total of 20 players eligible for free agency in one of the three forms, Unrestricted (12), Restricted (5) and Exclusive Rights (3). Miami's 20 free agents are split nearly equally with 11 players on offense and 9 players on defense. The depth chart below highlights the defensive free agents based on the colors shown above. Each player has been given a grade by the author, the grades are up for debate in the comments section. Only the eligible free agents will be evaluated. Before beginning with Free Safety it is imperative to recognize the importance of the safety position in relation to special teams. Safeties are usually the best special teams players because they play in the open field and are generally excellent tacklers. Two of the three players at free safety are unrestricted free agents, Chis Clemons and Tyrone Culver. Chis Clemons: Clemons is an unrestricted free agent and an interesting decision for the Dolphins, his numbers certainly do not sparkle. Clemons has been a steady reliable player for Miami the past two seasons. The problem for Clemons is, he is not a playmaker. He is not one of those players instinctively around the football. If Joe Philbin makes the changes necessary to fix Miami's turnover ratio deficiency, it could mean Clemons will be upgraded for a player with better ball skills. Miami will probably allow Clemons to test the market, but may re-sign him if the price is right. Either way, Clemons will have some competition next season. Tyrone Culver: Culver is a journeyman special teams maven whose value is limited to that quality. Miami would love to hang on to him. He has been released and returned to the Dolphins several times in the past, but Miami will only offer the veteran minimum or slightly more. Culver will see if another team will offer more, chances are, he will return to the Dolphins one way or another, but not for a high dollar contract. Jonathan Amaya: Amaya is a restricted free agent strong safety who has had several stints with the Dolphins. He will be offered a late round tender and will be on the roster to compete next season with no guarantees. Bryan McCann: McCann is a restricted free agent three-year veteran at right corner who has played for the Cowboys, Ravens and Raiders before being signed by the Dolphins in early November. His moments of glory came in 2010, when he was named NFC Defensive player of the Week after intercepting an Eli Manning pass and returning it 101-yards for a touchdown, setting a record for the longest interception return in Cowboys history. The following week he was named the NFC Special Teams Player of the Week after returning a punt 97-yards for a touchdown against the Lions. There is some intrigue, but McCann has been unable to stick on 3 other NFL rosters so something is missing. He will be tendered a late round draft pick and allowed to leave if another team matches. Sean Smith: Smith is an unrestricted free agent left cornerback. His numbers tell the tale of a good corner but not equal to the dollars his agent is demanding as a dominant defensive back in the NFL. Smith falls in line with Chris Clemons, he is not a playmaker. If Joe Philbin is going to change the turnover margin on the Dolphins, it will begin with upgrading the cornerback position. At one point during the season, Smith had more passes thrown against him than any other corner in the entire league. QBs know he is not going to make a play on the ball and they can take chances throwing balls in his direction. He has skills and excellent size, but he doesn't make plays and opposing QBs are not afraid of him. The numbers for the Miami secondary are skewed because the run defense is one of the best in the league, teams would rather throw against the Dolphins. In four seasons Smith has not shown the ball skills that would make him a top dollar CB. Something will have to give here. History dictates that Miami should not throw big dollars at a CB who has not provided the goods. Another team may be willing to take a chance because CB is such a critical position in the NFL. Miami will more than likely let Smith move on and bring in several replacements. CB will probably be the first round selection for the Dolphins if the right player is available. At least 2 of the 5 picks Miami has in the first 82 will be used in the defensive backfield and both may go to corner if the coaches feel Jimmy Wilson is ready to step in at free safety. R.J. Stanford: Stanford is an exclusive rights free agent and will be retained by the Dolphins for the minimum contract. He will compete, but may not make the final cut out of training camp next fall. Austin Spitler: Spitler is a restricted free agent middle linebacker. Spitler has made a career as a special teams' player and will be given a late round tender. There are teams that may value his abilities on special teams, but Miami will likely match any reasonable offer. He will more than likely be a Dolphin next season. Randy Starks: Starks is an unrestricted free agent defensive tackle. Starks has been an excellent player for Miami in the most unglamorous of trenches outside of a rugby scrum. One of the prime reasons teams pass the ball on Miami is because running against Randy Starks and Paul Soliai is a losing proposition. There are few stats that can show the impact Starks has on a football game, but he is one of the best and most underrated players on the Miami roster. It is hard to place a value on Starks, with the exception that 2013 will be his 10th season. The question is, can Starks play at the same level over the course of a 4 or 5 year contract? Many pundits who believe Jake Long or Sean Smith will be franchised by the Dolphins may be surprised if the designation falls on Starks. It is not always easy to keep what is proven good in a rush to fix what's broken. A long term contract may not be in the cards for Starks, but the franchise tag? Tony McDaniel: McDaniel is a restricted free agent defensive tackle. The Dolphins will tender McDaniel with a mid-round pick, but there is a chance another NFL team will make a better offer. The future for McDaniel in Miami could be closely tied to what the Dolphins decide to do with Randy Starks. Miami may not be willing to lose both tackles and Starks leaving could be McDaniel's gain. The answer will solve itself when the cards start to fall on March 12th. Sean Smith and Chris Clemons are unlikely to be in Miami next season. Randy Starks could find a one season bonanza as a franchised DT. Miami will be targeting the DB and WR positions this off-season. If Jeff Ireland is as smart as Stephen Ross believes, he will invest in players that perform and spend on the needs Joe Philbin has identified.